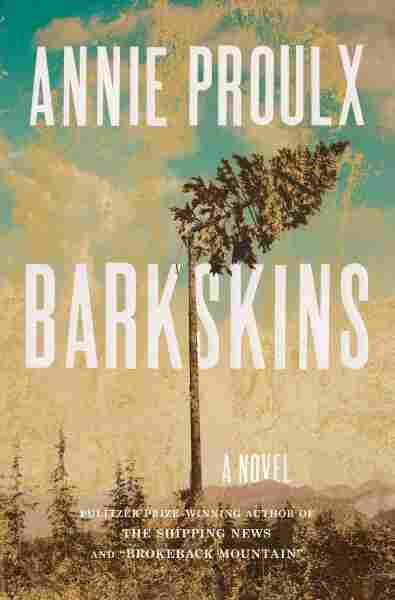 Annie Proulx's Bloody New Novel 'Barkskins' Is About More Than Deforestation Barkskins follows two loggers' stories over three centuries. Proulx says the forest is the hero of her book, but it's also "one facet of larger things, like climate change and the melting of the ice." Writer Annie Proulx won a Pulitzer Prize for her novel The Shipping News, and her short story "Brokeback Mountain" became a Hollywood blockbuster — but her new novel is her most ambitious work yet. It's called Barkskins, and to say it's about deforestation undersells the book's drama, blood and epic sweep. The novel opens with René Sel and Charles Duquet, two young, 17th-century Frenchman working in the forests of New France as wood-cutters and indentured servants. Proulx follows Sel, Duquet and their descendants over three centuries. She takes her readers to North America, Europe, China and New Zealand, all while detailing the fashion trends of the moment and the evolution of saw technology. Proulx tells NPR's Ari Shapiro that it took a lot of research to build the world of Barkskins, but that's exactly why she did it. "This is extremely pleasurable work for me," she says. " ... The research and the poking around, the gathering of unusual words and places, the joining together into a coherent shape is fun." On the meaning and origins of the word "barkskin"
Somebody who has skin like bark. People who work in trees would be a natural to be called barkskins. It's not a word that's commonly used and I can't find where I heard it or saw it — it's entirely possible that I made it up, I just don't know. But it was Barkskins before even the first word was written. It's the character. ... It's the underpinning of life. Everything is linked to the forest. This is but one facet of larger things, like climate change and the melting of the ice. So deforestation is part of a much, much larger package. If I'd been really ambitious, and more crazy than I actually am, I would have tackled the whole shebang. But I didn't; I just concentrated on forests and depend on readers to put two and two together and come up with 17. ... logging is not gentle; it's fierce and it's hard work. It's noisy, it's messy and it leaves sad things behind — stumps and broken branches. I've been around logging operations for most of my life. I've seen what's going on; I've studied them; I've heard them; I've watched them. You know, it's part of life in certain places in the world. I grew up in New England where logging began early and has persisted unto this day. So logging is not gentle; it's fierce and it's hard work. It's noisy, it's messy and it leaves sad things behind — stumps and broken branches. At one point, this entire globe was covered with a thick, thick mantle of green, and we've taken it away. ... Readers are not dumb and they do not need to have it all carefully spelled out for them. They can figure out whether an interesting character who's a chopper is doing a bad thing or a good thing, to put it in a very bald and basic way. And if there's conflict in the reader's mind, good. I was myself surprised at the unusual ways that people died in past centuries — different kinds of accidents and so forth. So now when we see that a logger was caught in the cleft of a tree or that someone froze to death on his way back home in an ice storm aboard a ship, we're rather amazed. But no, these things happened to people. ... I mean, if you've got to kill off a character, you might as well do it with a bit of panache.